Which LED color is good for turn signal lights? I bought the LED lights for the backup reverse lights and it is dimmer than my stock, is that ok? Why do my LED turn signal lights hyper flash? Do you recommend LED bulbs for the tail lights? 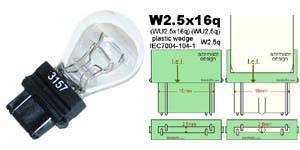 What's a switchback LED bulb? Will these switchback LED bulbs replace the single filament stock bulbs? Why do the stock 1156 bulbs light up, but both the 1156 LED bulbs don't? A T20 bulb is commonly known by industry standards as the following bulb sizes: 7440 7441 7443 7444 992A, etc. These T20 bulbs are commonly used for the turn signals, tail/stop lights, reverse lights, and daytime running lights. A T25 bulb is commonly known by industry standards as the following bulb sizes: 3156 3056 3157 3057 3357 3457 4157, etc. 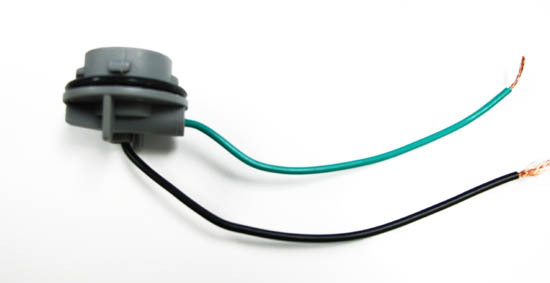 These T25 bulbs are commonly used for the turn signals, tail/stop lights, reverse lights, and daytime running lights. 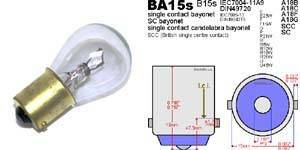 The term BA15 means Bayonet base with 15mm in diameter. 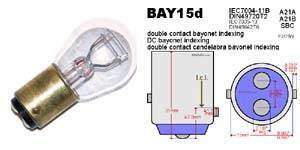 A BA15 bulb is commonly known by industry standards as the following bulb size: 1156 7506 7527 1157 2057 2357 7528 P21W P21/4W, etc. These BA15 bulbs are commonly use for turn signal, tail/stop lights, reverse lights and daytime running lights. It should be ok because the backup reverse lights are meant to alert others so they know there is a car is reversing rather than actually illuminating the road. When your LED turn signals flash rapidly, that is known as "hyper-flashing". The rate that they blink is roughly twice than the normal flash rate. This is because when you replace the stock turn signals with LED bulbs; due to their low power draw, the regular rate of power being given to the lights is more than enough to light them up which speeds up the blinker process. Although this will not damage your vehicle nor the LED bulbs, some people may find it a distraction and may want to have it blink at the regular rate. To have the LED bulbs blink at a regular rate, you would need to purchase load resistors . How to install LED resistor? For tail lights, we recommend keeping the stock bulbs instead. Since most tail lights have a red lens covering the bulbs, the output and color of the LED will not be as great as how they would be in a clear lens housing. LED bulbs will work better when they are used in a housing with a clear lens housing such as the reverse backup lights, front and rear turn signal lights. A switchback means it has two colors (White and Amber) which can switch back and forth. 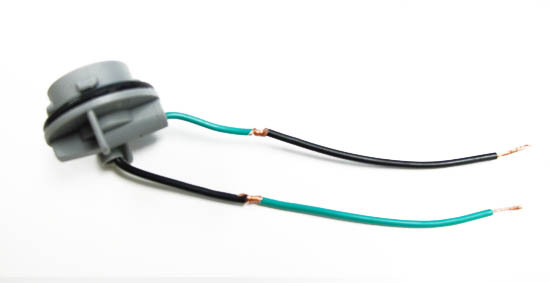 It is commonly used to replace the double-filament bulbs for the front turn signal lights which can function as both parking position lights and turn signal lights. So this way you can have the parking position lights in a HID matching xenon white color and the turn signal lights in a street legal amber yellow color. To sum up in order to install the switchback LED bulbs, you will need to make sure your front turn signal lights function for both turn signal and parking lights and the lens needs to be clear. No, the switchback LED bulbs will only work with dual filament housings such as 1157, 3157, and 7443. However, we do carry a special single filament switchback LED available which will work for 7440 single filament housings. Please take a look at these two diagrams below. The conventional socket has positive terminals on both sides but the SRCK socket has positive terminals on the same side. So a non-SRCK compatible LED bulbs installed to a SRCK socket will cause a short resulting fuse-pop or even damage the LED bulb. 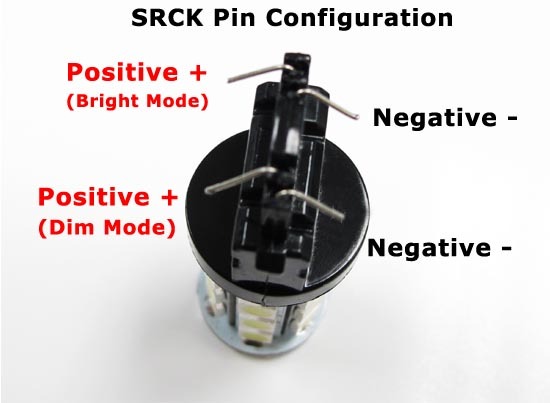 However, don't worry because iJDMTOY's LED bulbs are mostly SRCK compatible. 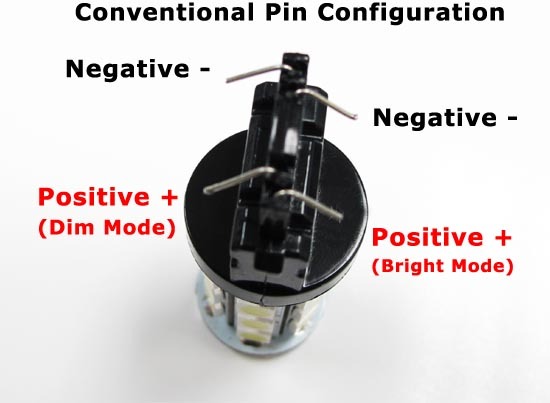 For 1156 or 7507 LED bulb, the button is positive, and the base surrounding is negative. However for a small portion of the car, the wirings are reversed, causing the polarity mismatch. If you are encounter this issue, please let us know and we can exchange you a different types of 1156 LED bulbs which are non-polar. Or you can reverse the socket harnesses around. You may notice that the 1156 and 7507 bulbs have tabs on the base that do not exactly match. The 1156's tabs are 180 degrees while the 7507 tabs are 150 degrees. These two bulbs may not seem compatible, but there is a very simple modification that can be done to the bulb's base to fit it into the housing. An example would be a 2007 BMW E90 325i. 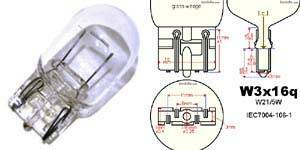 A product description may advertise the bulb as P21, but that could mean a 1156 or 7507 bulb. Either the 1156 or the 7507 would still be compatible. Step 1: You can see that the tabs in the 1156 LED are directly across from one another (180 degrees) while the stock 7507 bulb has tabs that are 1/3 from one another (150 degrees). Altering the stock 1156 LED bulb to fit into the 7507 housing is very simple. Step 2: Use pliers to cutters to snip off one of the tabs from the 1156 LED bulb. Step 3: Insert the 1156 LED bulb into the 7505 housing and twist to lock. 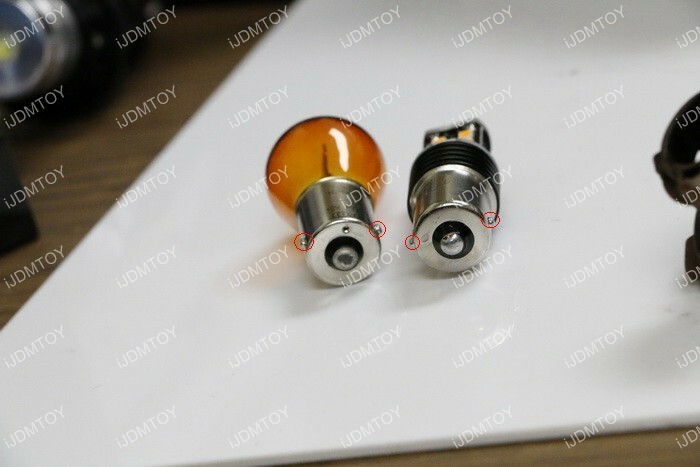 There shouldn't be any worry that the 1156 LED bulb will slip out of the housing because the single tab will ensure that the LED bulb stays locked into the housing. The bulb is also deep within the housing to stay secure. This slight alteration works both ways, with a 1156 bulb into a 7507 housing or 7507 bulb into a 1156 housing.